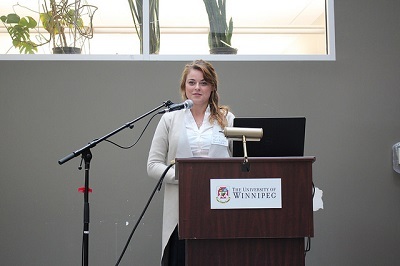 On October 27 & 28, the Peace and Conflict Studies Students Association hosted a Graduate Student Conference at both the University of Winnipeg and the University of Manitoba. We connected with the organizers, some presenters, and participants of this event to hear about their experiences. Can you talk about the theme of the event? The theme of this year’s conference was “Peace without borders”. The theme was intended to touch upon critical issues of our time, including the global refugee movement, right-wing nationalism that seeks to establish borders between people of different ethnicities, and peacebuilding efforts that are constrained by physical and psychological/social barriers. We were fortunate to have just over 30 presenters, and of course our gracious keynote speaker Senator Marilou McPhedran. One of the biggest challenges was to determine a time and date for the conference that would be convenient for most people and organize logistics. There are so many events going on at the two universities, let alone external events in the city, that it is always a challenge to find a suitable weekend. Some of our students are with the JMP program and it was therefore important to makes sure we held the event on location at both campuses. This is something we were delighted to achieve this year with the tremendous support of the teams at both the University of Winnipeg and the University of Manitoba. What did you learn from organizing this event? Inga: Personally, I have learned that it takes a lot of effort and dedication to plan events like our PACS Conference. The conference itself might only be two days long and include less than 100 people, but still there is such a wide array of things that have to be considered for it to go over smoothly. I have definitely come to appreciate the hard work of my fellow council members and the way in which we have supported each other. Each of us has put a lot of effort into planning this conference, and we were able to rely on each other to do a good job. Kathleen: Organizing the event was a huge challenge for me, and one thing I learned throughout the process was how having a great team of committed individuals can make the process both efficient and enjoyable. I also learned that these types of conferences are such an integral part of bringing together our amazing community. The presentations were uplifting and enlightening, and I felt honoured to be able to facilitate the event, and participate with all the attendees and presenters. Can you tell me about your presentation? I presented a paper titled “Indigenous Peacebuilding: Lessons to be learnt from a Tribe on the Verge of Extinction”. The paper was about Indigenous Kalash Tribe in Pakistan that has preserved its unique culture and practices for the past 3000 years but now face a threat of extinction with only 4000 remaining members. As a PAC student I always found indigenous culture and peacebuilding practices fascinating. During the summer when I was in Pakistan, I saw a documentary about the Kalash Tribe. I never knew that such tribe exists in Pakistan because Kalash people live in remote mountain valleys in Northern Pakistan. I decided to visit the Kalash valleys to learn more about Kalash people and found their culture and practices very fascinating and different from mainstream Pakistani society. How did you feel your participation in this conference contributed to your academic journey? It was a great opportunity to speak about a group no one has known before. I was intrigued by the appreciation and valuable comments and feedback after the presentation. It was fascinating to hear about different indigenous groups from different parts of the world. After the conference I had a chance to discuss it further with my supervisor and other PACS students and decided to focus my doctoral research on Indigenous Peacebuilding and to explore further about the Kalash tribe. Dagmawit: I attended the conference because it is directly related to the course, which I am currently taking (Global Citizenship) as part of the Human Rights undergraduate program. My Global Citizenship course has thought me that we are all tied together as citizens of the global community, and that our challenges are interconnected. 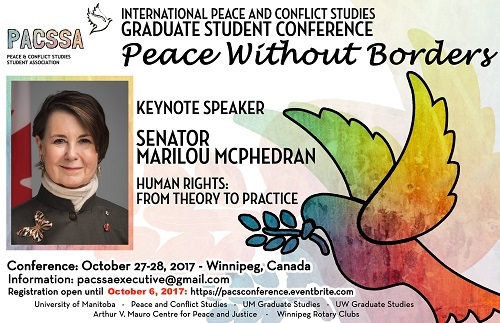 This conference gave an opportunity for students, academic staff and supporters and advocators of peace to come together and share their works in peace building initiatives. The theme for the conference, “Peace without Borders”, is a timely topic as the need to tightening border control and nationalist ideologies have become increasingly the norm these days. However, everyone wants to live in peace. The conference discussed the crucial need for cooperation and collaboration and global efforts towards peace beyond the physical borders. This is what global citizenship is all about; to be concerned and act to bring about change beyond borders. Even though it was a well-organized conference, I wish there were more participants from students and the academic staff from different programs as well to enrich the discussion. 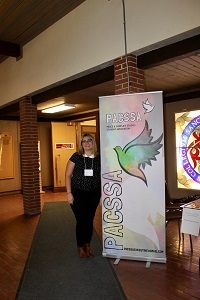 Ashley: The 2nd Peace and Conflict Studies (PACS) International Graduate Student Conference presented by PACSSA was an opportunity to listen and learn from what other student’s in the PACS program are working on. There was a wide range of topics that included Indigenous peace rituals from Africa and using poetry or storytelling to heal trauma. I think a major advantage to a conference structured in this way is that an observer can expe rience how wide spread our work as peace makers truly is. Our interests span a wide scope of topics, and we are involved with numerous initiatives. We work with framework that encourages building peace in the home to models for addressing global conflict. We are making change in the world and this conference was a great way to highlight some of the work students in the PACS program do. The nature of a student led conference is also important to allow students the opportunity to practice skills such as room moderation and event organization. Click here for more research features.